Gwen Lawrence has been massage therapist for 20 years and a practicing fitness professional since 1990. She has an extraordinary understanding of anatomy and body functions, combining Massage Therapy, Yoga, Training and Yoga Therapy. 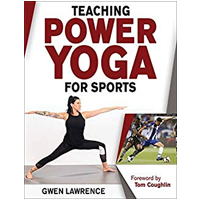 At Gwen’s Yoga School, her focus is on a sport-specific yoga program, Power Yoga for Sports and includes private yoga training and class instruction. Gwen’s unique combination of dance, massage and yoga training experience, coupled with her extensive knowledge of anatomy, and nutrition, provide her clients, and athletes with overwhelming benefits.